Graduate students: Edward Drizik, Josh Morof and Elana Folbe, all WSU medical students and Jewish Medical Student Association members; Mitchell Shecter, MSU DO; Mara Steintz and Molly Levine, WSU law student and Jewish Law Student Association member. Detroit-based grad students form a new association. Throughout the stressful process of applying to medical school, it did not cross my mind to consider the school’s Jewish community on campus. Fortunately, Wayne State University’s School of Medicine, where I am currently a second-year student, has a larger and more active Jewish community than I ever would have imagined. While Jewish students make up only around 5 percent of our school, our Jewish Medical Student Association (JMSA) has nearly 60 members. Our group puts on monthly bagel brunches and hosts Shabbat dinners each semester, sponsored by Hillel of Metro Detroit. We spend time volunteering at organizations like Yad Ezra and participate in Jewish community events, such as NEXTGen’s Pitch for Detroit. Recently, we started a relationship with the American Healthcare Professionals and Friends for Medicine in Israel, also known as APF, where Jewish doctors come to speak to our students about how to support Israel as a physician. Most importantly, we work to maintain our sense of Jewish identity while building a Jewish community for medical students living and studying in Detroit. 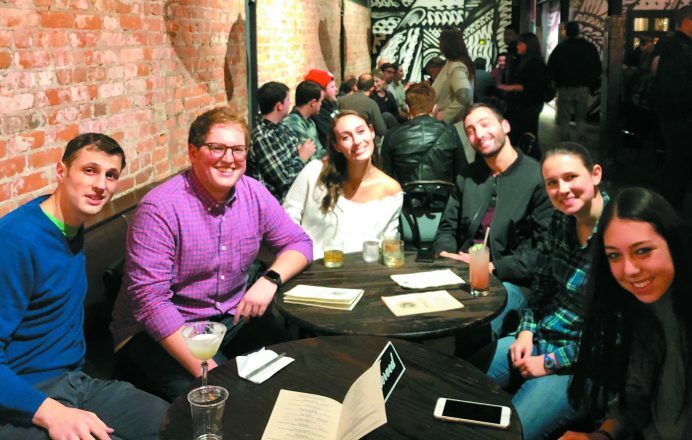 While we do not leave the lecture hall to explore our city as often as we would like, it is still very apparent that Detroit is rapidly becoming the place for young Jews to live and work. Yet, while we have large Jewish student groups at our medical and law schools, one thing we are missing is a strong and united Detroit Jewish graduate student organization. Josh Morof of West Bloomfield is a medical student at Wayne State University. For more information or to get involved with the Jewish Medical Student Association or the Jewish graduate student community in Detroit, email him at jmorof@med.wayne.edu.